I came to the market a little too late on a recent Friday. It was all of 4 P.M., but half the stands were closed. Discarded vegetables lined the path, as greengrocers dumped unwanted produce before the weekend. Piles of lettuce leaves that came to my waist. Boxes of mushy tomatoes, being picked over by foreign workers. Oh, and a small pile of fresh thyme and oregano. So I admit it: I picked them out of a box in the street. They’re not things I usually buy; finding them was a bit of a bonus — a chance to work with something I wouldn’t have thought to use. And most of the stuff being sold in the market has hit the ground at one point or another anyway. I sprouted some lentils to make them fresh-tasting and peppery (they’re better for you this way, too, and can be eaten uncooked), added dried cranberries for sweet tang, and tossed in lots of fresh herbs, to finish the summery burst of flavor. Because even if it’s fall, some things always taste good. Start the lentils a day in advance (or at least several hours in advance): Cover with a few inches of water in a bowl, and let soak for about 8 hours. They will have more than doubled in size. Then, empty into a strainer and let sit, rinsing every few hours. 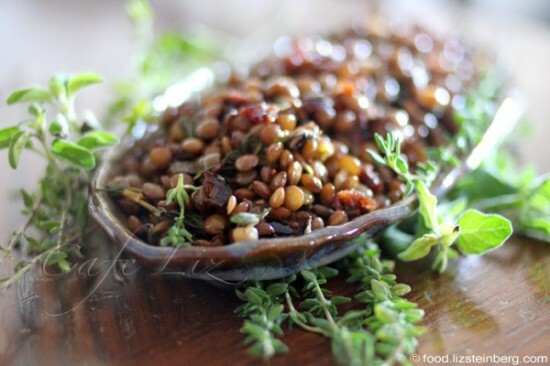 The lentils are ready to cook as soon as they have a light, peppery taste, and no longer have the texture of rocks — after the first 8 hours or so. The extra time in the strainer gives them a chance to sprout a bit. If you leave them for a day and a half or so, you’ll start to see little bitty roots peeking out. 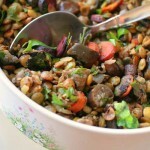 Drain and rinse the lentils, put into a pan with a lid, and let simmer covered on a medium flame with a tablespoon of good olive oil, the 1/4 cup of water, 2 tablespoons of vinegar and the 1 teaspoon of salt. Chop the cranberries into small bits, and add to the pan. Cover again. Chop the herbs. Turn off the flame and add them to the pan, and mix. You want them to wilt but not to become totally soggy. Serve. Add another tablespoon of good olive oil as dressing (this is optional — it already contains some olive oil, but I like the flavor). 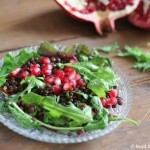 9 Responses to "Lentil salad with cranberries and thyme"
the recipe looks great. i really like recipes with that don’t go overboard on the ingredients, yet each one has a lot of flavor. Indeed. When recipes have too many ingredients, they get too complicated and I get too lazy to make them. What a delicious looking recipe, I can’t wait to try it! Does it matter what kind of wine vinegar? I have both white and red in my kitchen! Hi Shira, I guess I wasn’t entirely specific, because I actually used sherry vinegar. I’d say that the choice of wine vinegar isn’t that critical, and it’s up to you what you use. Good luck! I never knew lentils could be prepared this way. Thanks for sharing! The cranberry and thyme combination sounds delicious. 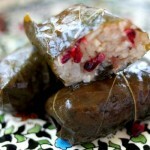 So glad i came accross your blog- the pictures are beautiful and the food looks amazing. Your writing reminds of me of everything wonderful that is Tel Aviv and its markets. Thanks and shabbat shalom! Hi Skai, thanks for stopping by and commenting! Excellent combination! Added to my list of quick foods. I didn’t have time to sprout the lentils, so I just soaked them during the day. Whatever I didn’t cook, I put in the fridge, and by the next day, they sprouted.